Today is officially the count down to my gorgeous sister’s wedding- 1 year and counting, then Santorini here we come! So I am turning over a new leaf and becoming more healthy and full of vitality! 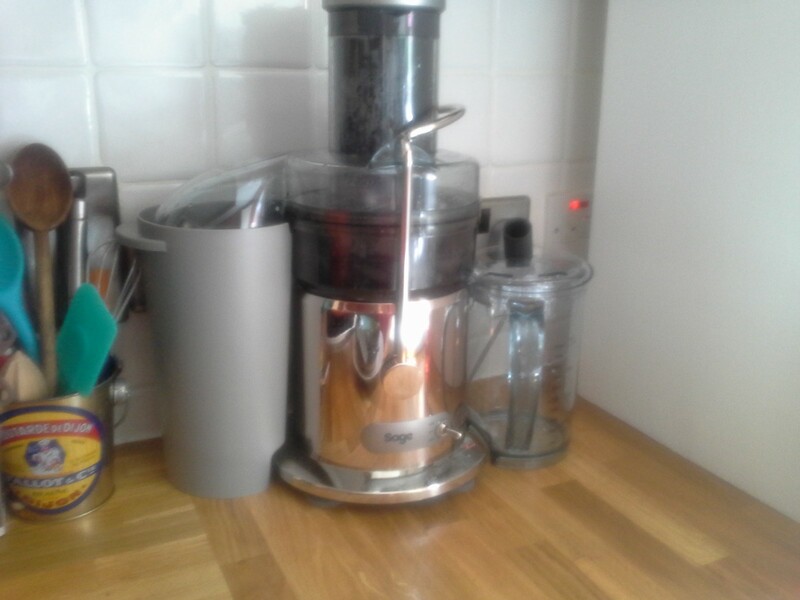 Or at least that is the plan and to help me I have invested in a new juicer….. Here it is in all it’s glory! Kitchen rearranged to fit it in and I am determined to use it every day- well, I’ll try at least. 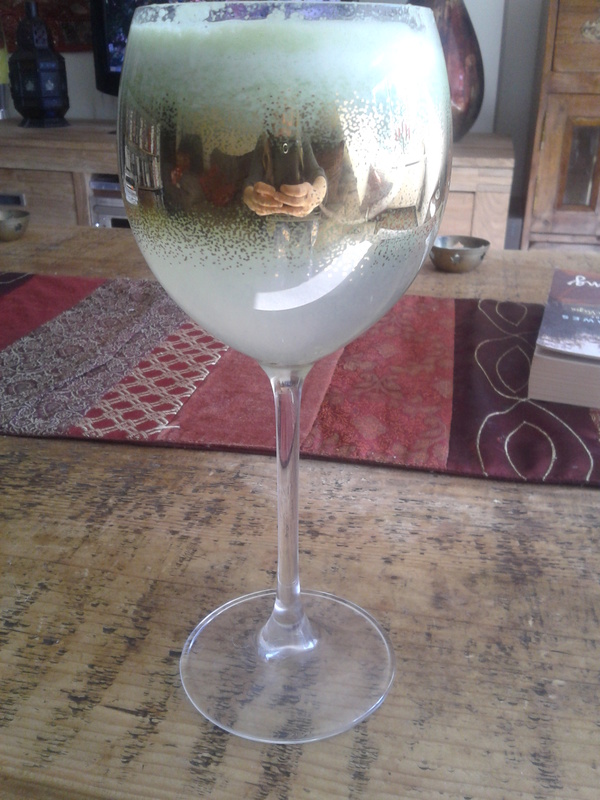 A foaming glass of green goodness: 2 apples, 1 pear, 2 kiwis and 1lime. Delicious and kept me going until lunchtime. 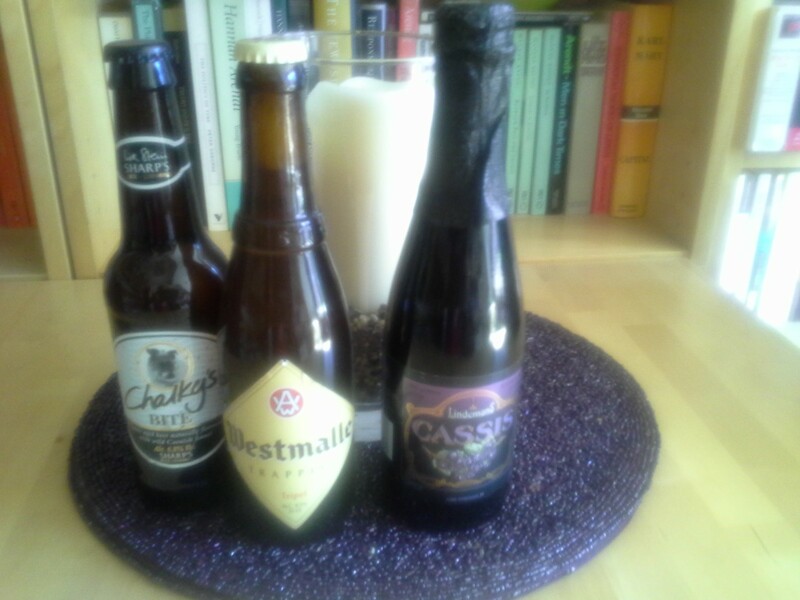 A small trip out in the afternoon took me for a walk in the sunshine ending in Hampton at the beer shop…..
My favourite Westmalle, and super refreshing Chalky. They are now in the fridge getting ready freezing cold, as they should be. Dinner was a roasted veggie tart: puff pastry loaded up with aubergines, courgette, onion, tomato and red pepper. A hit, served with some buttered jersey royals. Yum! It may be a bank holiday weekend but we are both working- poor us!!! However, we were both off for the last bank holiday weekend so I guess this is only fair. So to make life happier we have needed 2 delicious dinners, and Saturday night was a particular triumph. Season the fish and either pan fry or roast in the oven for 15mins. I used the oven as the flat is small and can be overwhelmed with fishy smells! In a large pan heat the oil and add the garlic for 1 min. Add the peppers and cherry tomatoes and stir for 10mins. Add the chickpeas and paprika and cook for 10mins until hot through and fragrant. Season. 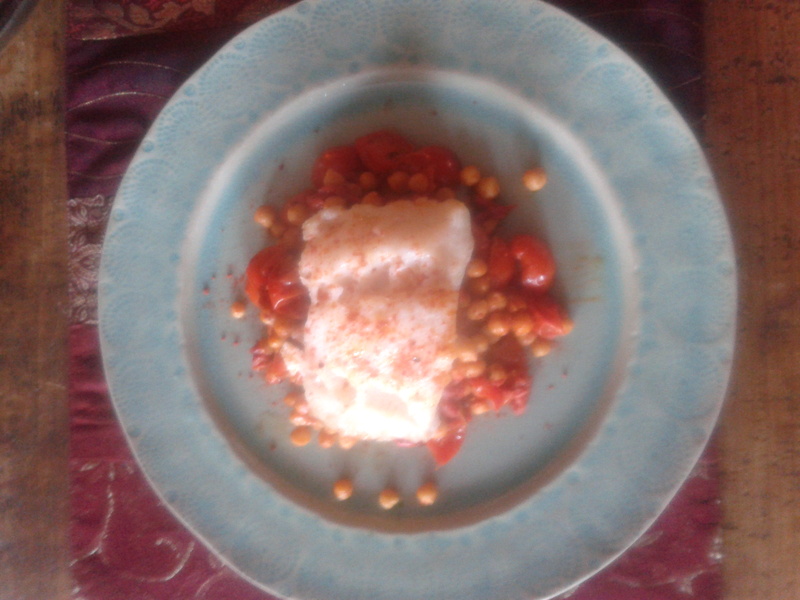 Serve the fish on top of the chickpeas with a sprinkling of paprika, and a squeeze of lemon. Both Thomas plates were completely emptied which is always a good sign. A good bottle of old vine Zinfandel made for a lovely evening, ready for another day at work while everyone else is enjoying the (rare) sunshine! 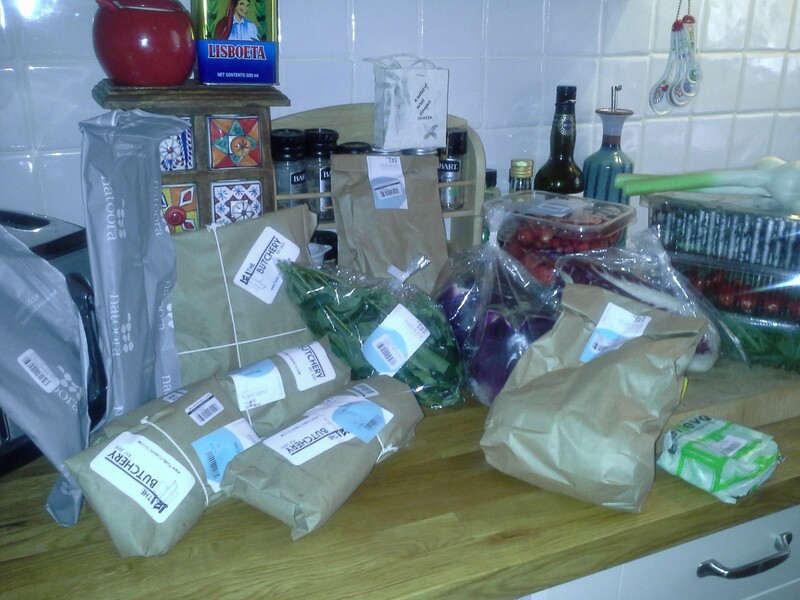 I seem to have a habit of picking the wrong food for the weather at the moment…. a side effect of planning in advance I suppose. So despite today being gloriously warm and sunny we are having Shepherd’s Pie. Lovely though, I can’t complain as once again 2 completely empty plates. And for once I have managed not to completely overeat which I almost always do with Shepherd’s Pie. Another portion ready for a late night dinner- yippee! 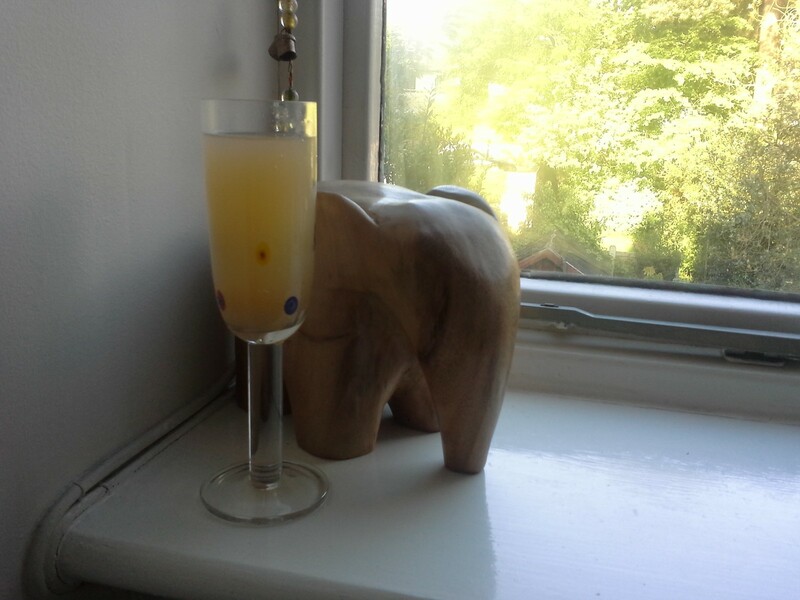 Here is a sneaky Bellini to welcome in the sunshine! Yesterday, however, was my day off. A lovely restful day interspersed with some good food. 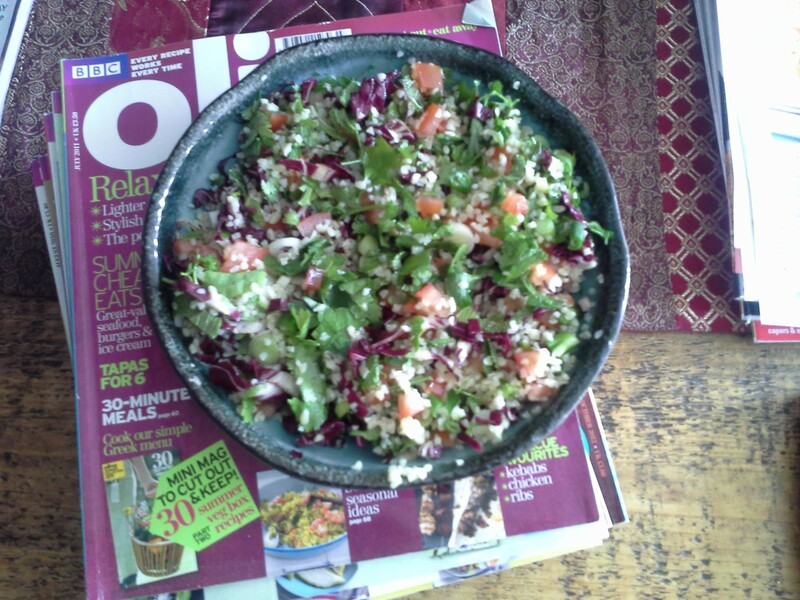 Lunch was a healthy and yummy tabbouleh. Pour boiling water over the bulgar and leave to stand for 20mins or so until it has softened and is a good texture to eat. Drain and cool. In a large bowl mix all of the ingredients, squeezing over as much lemon juice as you like- I use the whole lemon as I like it quite sharp. Don’t be stingy with the salt either as the tomatoes really love it. This is great for a tasty lunch, but we often do it as part of a mezze type meal. Lunch is sitting on top of a pile of Olive magazines from the past couple of years. I am continuing my cull of magazines so spent the day going through and tearing out recipes to try. Actually got through them all but spent the entire say starving, looking at such great foodie ideas. Lots to inspire me in the weeks ahead! It’s always a good excuse to get the gravy pan out- one of my favourite kitchen things. The sausage were very tasty, massive and meaty, and possibly a bit too wide for the mini toads here. 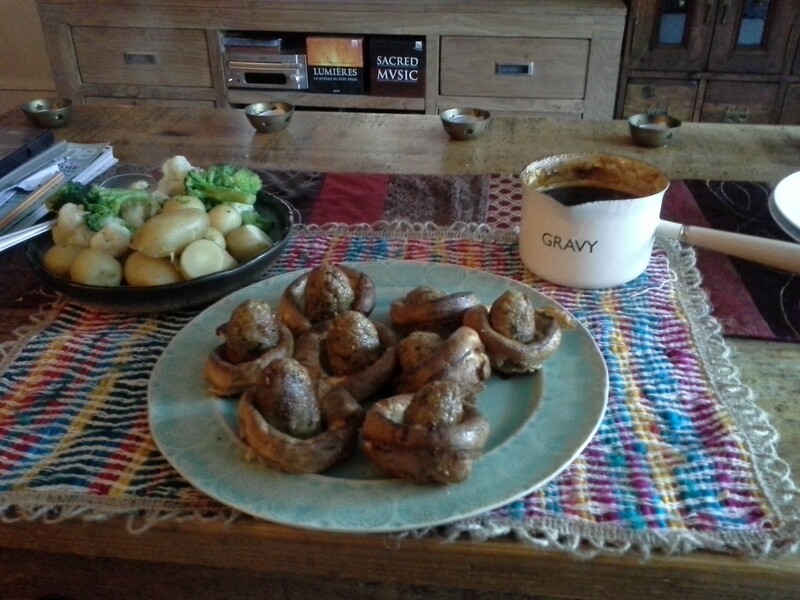 But the gravy was delicious- WR red wine beef gravy, jazzed up with a stock cube, sausage cooking juices and a splash of soy sauce to make it really, very savoury. A good dinner all round I’d say. Our weekend off so we started Saturday with a delicious delivery from Natoora- full of delights, although over an hour late….. We were planning on going our for lunch and started to get anxious that we would be waiting in all day (ok, it was just me getting anxious, Colin knew we had plenty food arriving to keep us fed!). Their website is particularly seductive, and I fell for some great veg which I used for Tonight’s dinner. Beautiful globe aubergines and courgette! 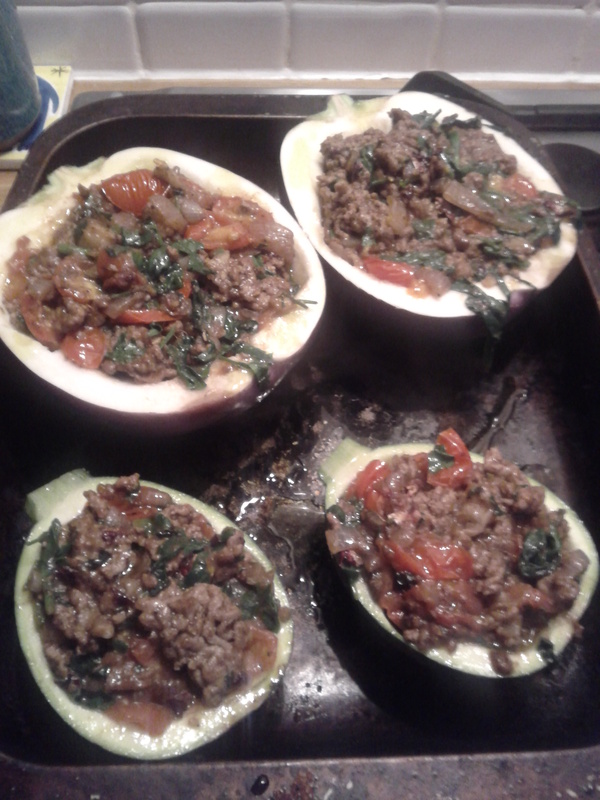 I stuffed them with a spicy mixture of lamb mince, onions, the flesh of the veg and some Moroccan type spices- Colin’s favourite ras-al-hanout! Roasted in the oven for about half an hour and served with a harissa tomato sauce and salad. A great accompaniment to the Eurovision, yippee!!! Inspired by national baking day I got up and whipped up a batch of strawberry and apple muffins. They were easy and delicious and great for a mid morning coffee. Here’s the recipe for 8 big boys! mix the flour, ground almonds, sugar, baking powder, cinnamon and salt in a large bowl. in a separate bowl mix the vanilla, butter, eggs and 180ml warm water. add the wet ingredients to the dry. Mix then add in the apple pieces. Spoon into the cases, about 3/4 full. pop pieces of strawberry on the top and sprinkle over the flaked almonds and sugar. Bake in the oven for 30mins. Eat when a little warm- really lovely. We went our for a long walk after coffee to blow the cobwebs away. 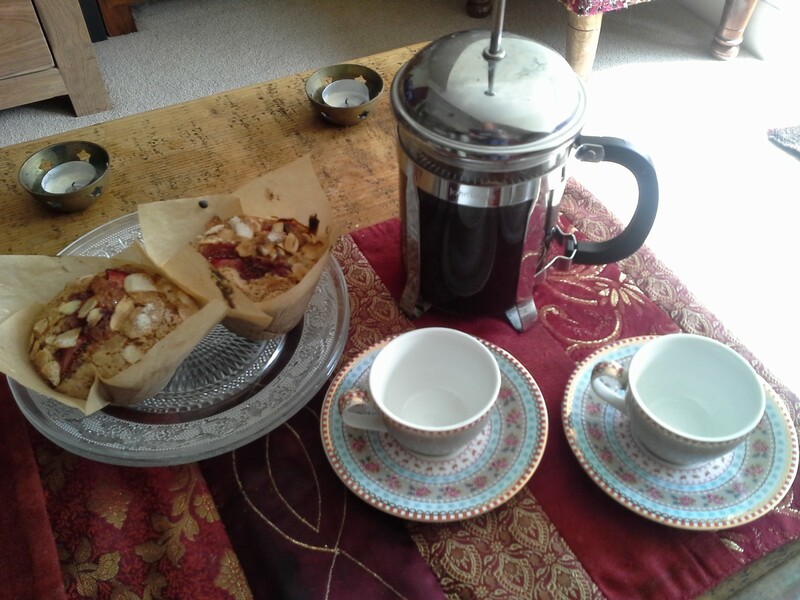 The muffins fortified us for the morning nicely. For lunch I made some mini pitta pizzas with the piccante salami from Natoora. We also had a glass of white wine from Plumpton Estate in Sussex which was lovely and light, and really cold. 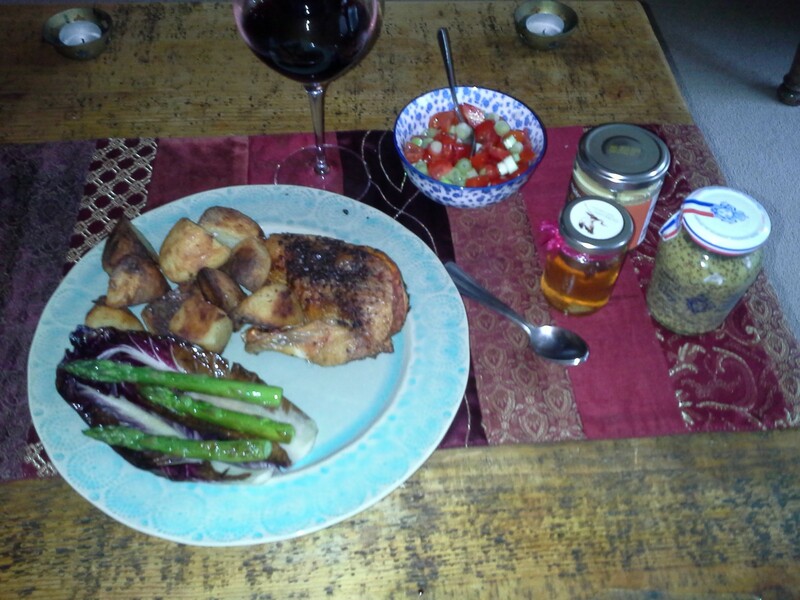 We finished the weekend off with some chicken, roasties, and griddled English asparagus and radicchio. What a delicious weekend we have had, seems a shame to go back to work tomorrow! I wonder why I always feel that I ‘should’ eat fish on Friday? I’m sure we didn’t have a fish on Friday rule when I was growing up, but I will ask the parents to see what their memory is! Tonight was a bit of an experiment…. … and really nice. I would urge you to give this a try. mix half the soy with the sesame and honey. Pour over the salmon and rub it all over. You could marinade this overnight for a more intense flavour, but I left it for only 45mins and it had taken on the flavour well. pop the salmon in the oven at 180° for 30mins, until cooked through. cook the rice in the water until he water has absorbed. Add the coconut milk and cook until all absorbed and the rice is cooked. use a potato peeler to peel long slices of the carrot and courgette. Stir fry all the veg in a wok for a min or two. Add the remaining soy and toss in the pan for another couple of mins. 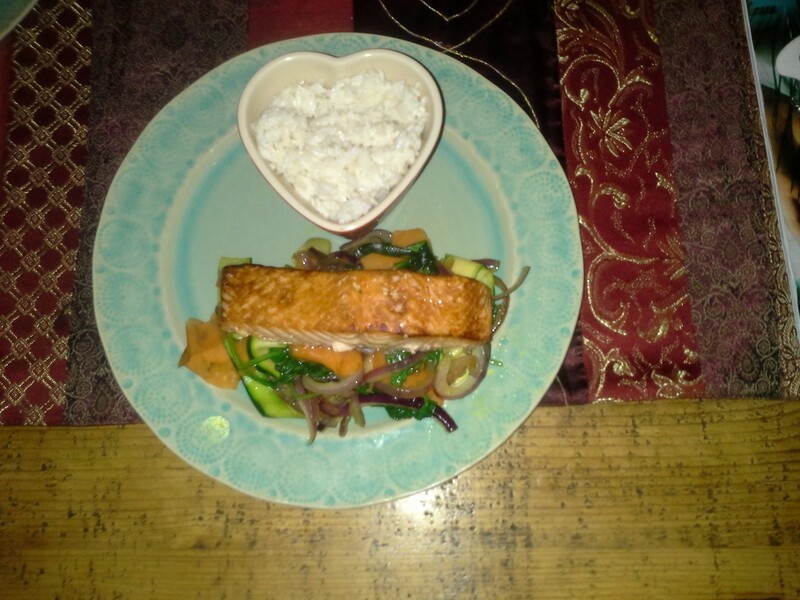 I have to make a confession though- I loved his dish but Colin did not! He loved the fish, thought the rice was good, but didn’t like the thin strips of veg- he thought they were limp and lifeless!!! Last night we were both a bit tired and hungry so we popped along the road to Brouge (www.brouge.co.uk) for some Belgian yummy delights! It’s in an old pub building called ‘The Old Goat’ which always makes me laugh for some reasons. Anyway, Mussels for me with crispy fried and a couple of bottles of Orval- just what the doctor ordered. Tonight Colin was working late so needed something to look forward to for dinner. Sausages are the obvious choice for such a night! I got hold of Colin’s favourite Old Spot pork and sage sausages and simply roasted them and served them with some little sautéed potatoes and salad.